You took the business from 0 users to 500, 2000, 5000… then growth starts stalling. Existing users are leaving. New ones are barely signing up. And you know ‘no growth’ is quite tantamount to ‘dying’. What do you do? Do you need a new marketing strategy? Is there a problem with the product? Did you suddenly drop in the SERPs? But regardless of why your growth has stagnated, what’s most important is how you bounce back, and that’s why today, we’ll be looking at 4 accessible growth hacking techniques you can use to kickstart your business out of a funk. New entrants or existing competitors often come up with new features your products don’t have. And many times these features become the “wow factors” in your industry. But many companies ignore these factors and fall prey to growth stalls. A study on the growth experiences of a number of top organizations reveals that a cycle of disdain, denial and rationalization keeps many teams from responding meaningfully to market changes. But instead of ignoring these competitor-induced changes, adjusting your product ASAP may be your best bet to sustaining growth in any industry. That is, you look at those “wow factors” and learn from them. That’s what your prospects want. If you don’t give them what they want, they will move on to wherever they can get it, and your business will plateau. Take Windows PC vendors, for example. They enjoyed the vast majority of market share for many years. 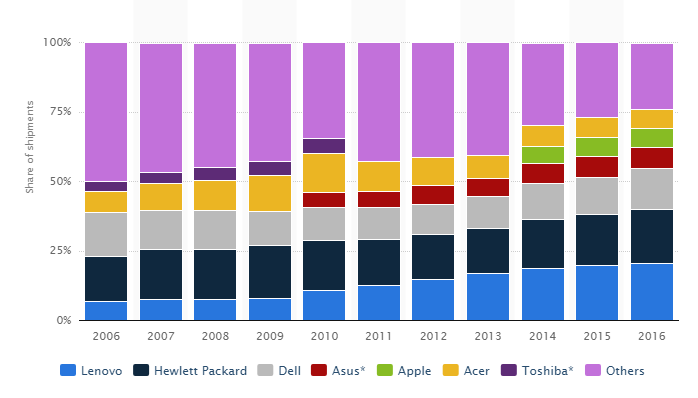 From 2006 to 2013, Lenovo, HP, Acer, Dell, Asus, and Toshiba kept occupied the top 5 spots for personal computer sales. Apple was barely even in the picture during those years, and the all of sudden, they snatched the 5th spot in 2014 and have held the spot ever since. Why? They identified two wow factors in their space – design and simplicity – and leveraged those factors to quickly gain market share. Competitors caught on and adapted, and now you can find many different PC vendors offering products with Mac-inspired designs and features. 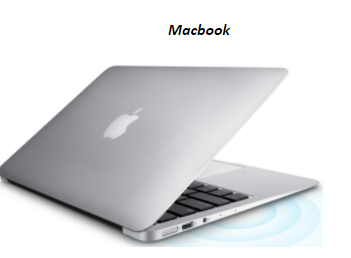 See how they all look like Macbooks? But obviously, HP isn’t the only PC brand protecting its share of the market from Apple. Other PC manufacturers that have withstood the test of time understand that looking out for wow factors and adapting to market changes keeps them relevant and in business. If you are experiencing stagnation in your business, it might be time to adjust. Look at the fastest growing business in your space, and see what you can learn from them. Growth doesn’t always come from genius. Sometimes all it takes is common sense. If you’ve been doing the exact same thing, but it’s stopped working, it might be time to simply try something new. 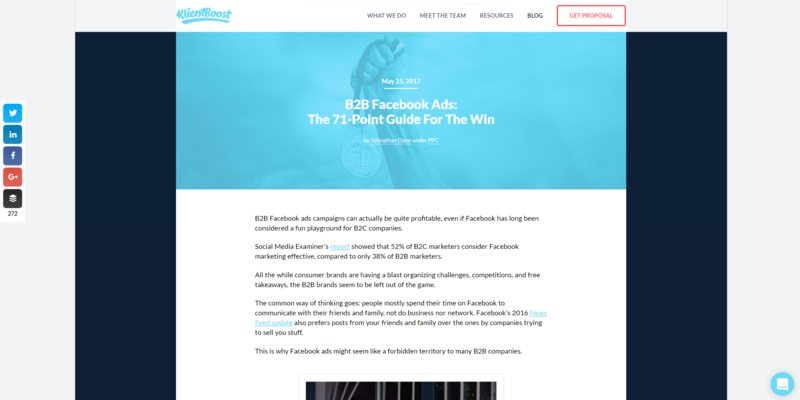 For example, PPC agency KlientBoost had spent over a year investing heavily in content marketing. They had pulled in some of the most prolific authors in the marketing space and were churning out well-received articles on a regular basis, but at the end of the day, their strategy wasn’t bringing in leads. 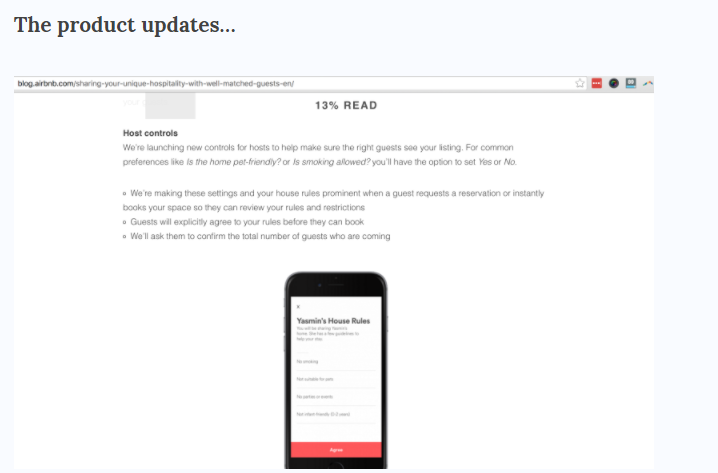 They decided to change things up and doubled the length of all their content, producing 3,000-4,000 word blog posts instead of the usual 1,500-2,000, and over the next year, the company ballooned from $100k MRR to $300k MRR. You don’t always know if a new strategy will pan out. But guess what? You know EXACTLY how your current strategy is performing. If it’s not working, try something new. Is there anything available to you that you aren’t taking advantage of? Does your friend have a column on Entrepreneur.com, but you’ve never taken the time to work out a post featuring your business? Does your quarterly webinar perform well, but you just haven’t bothered to invest in setting up more webinars? Do you know Facebooks ads work really well in your industry, but you just haven’t gotten around to setting up a campaign yet? These types of available resources are fine to ignore when business is growing and other strategies are working, but when growth is stagnating, it’s time to maximize these resources before you even consider looking elsewhere. 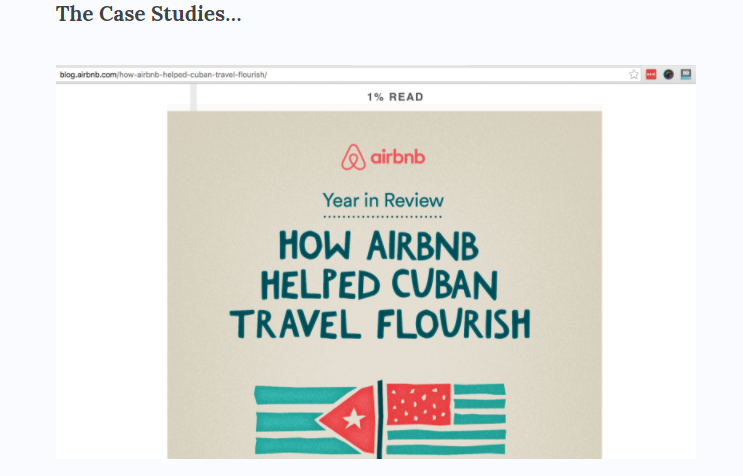 These same posts could have been used as a tool to drive brand awareness and growth for Airbnb — if they were on topics that would attract new Airbnb users. But they weren’t. 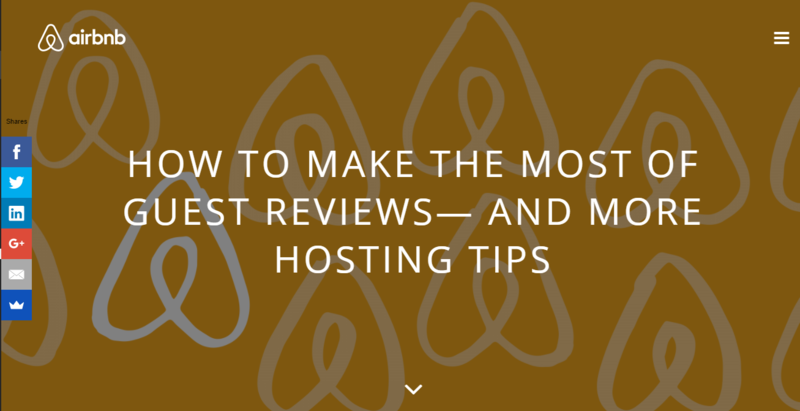 However, Airbnb now seems to have recognized the value their blog can bring and have more recently begun publishing the types of content Benji suggested. This is an example of a company maximizing an available resource. Look around. What resources are you currently failing to fully utilize? What has worked for you in the past but you never followed up? When growth is stagnating, it’s time to start listening to the people you don’t normally listen to – the people who AREN’T driving your current marketing direction. Different people in your company bring different skills to the table. Engineers understand your product. Salespeople understand persuasion. 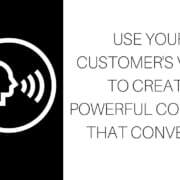 Customer services reps know exactly what’s on your customers’ minds. Instead of hunkering down on the same-old, same-old, look to bring in new perspectives and insights. Listen to everyone willing to offer feedback. Creativity is not exclusive to the field of marketing or growth hacking. Collaboration is one of the best possible ways to kickstart growth. Stagnating growth is nearly impossible to avoid, but it doesn’t have to be permanent. As your marketing strategies begin to decline in ROI, use these 4 simple growth hacking techniques to kickstart growth and resume your climb. Victor Ijidola is a content marketer and freelance business writer (for hire). He runs Premium Content Shop where he offers premium writing services that drive leads, and has been featured on sites like Inc.com, The Next Web, Kissmetrics and many more.